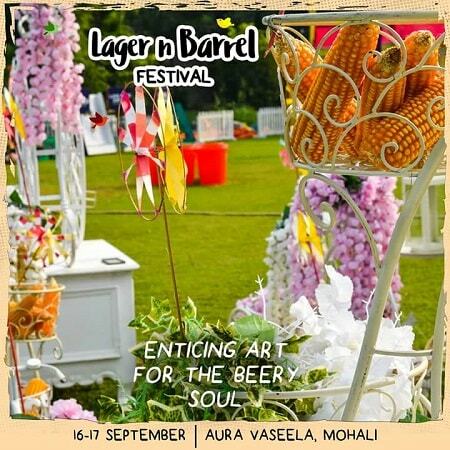 The most awaited Beer festival is back- Gaana LAGER n BARREL FESTIVAL 2018! Chandigarh is back with its most anticipated and phenomenal Gaana Lager n Barrel festival 2018. The extravaganza returns with its fourth edition this fall with its entertainment quotient double decked. Gaana Lager n Barrel Festival is co-presented by ItsMillerTime.in and is conceptualized by Speed records and EYP creations which is scheduled to happen on Sep 29-30 at The Village Chandigarh. The festival is North India’s first beer fiesta which lends you an exhilarating arena right from the late afternoon and the sensation lasts until late night. The carnival is an amalgamation of best culinary affair, enthralling music, exotic drinks, beautiful artifice, handicrafts and a number of games and activities all lined up to edge your entertainment dose. The festival had already carved its mark with around 7500 entries in the previous edition and it is speculated that a larger number will break through transcending borders this coming edition for a remarkable treat. The festival will serve you with some Indigenous and magnetic music. The profound tunes by famed artists including Papon, B Praak, Deepak Rathore Project, Ahen, Kutle Khan, Funky Boys, Train Local and many more will leave you blown. The eve is followed by a ultra rocking EDM performance by internationally celebrated electro house duo- Lost Stories which will leave the valley enchanted. QUICK BITES AND A PINT IN YOUR HAND over hearty music just adds cherry to the cake, isn’t it ? For all the food maniacs, the place will indulge with the best of the culinary experience, with the most signature delicacies and unique gourmet and mouth watering food, which will satiate your gastronomical pangs. You’re definitely to go gaga over the melange range of cuisines and drinks ranging from authentic to continental. Keeping in view its audience, ItsMillerTime.in has custom designed a BEER GARDEN, which elevates the very idea of the best out of the waste. The initiative is taken to encourage and promote the local artists and giving them space to showcase their creativity as well as for the audiences to capture the best of their pictures with scenic backdrops which will further elevate the vibe. Moreover, you will come across various stall where the artists will present the best works and handicrafts. Put your hands on the best and don’t forget to encompass your bargaining skills. You’ll come across various fun and frolic activities like Pac-Man, Staipu, Sumo wrestling and many more which will unleashed on the spot to keep your souls ingnited with excitement. Step out from the hustle bustle of your work life and indulge in the weekend full of surreal fun as the best of the beer festival is glaring your way. Tricity peeps, surely, you can’t afford to miss this one. ChandigarhX is proud to be associated as DIGITAL MEDIA PARTNER of Gaana Lager n Barrel Festival.